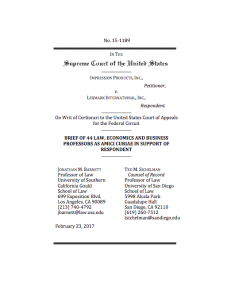 On February 23, 2017, Prof. Hugh C. Hansen joined an amicus curiae brief by 44 professors and scholars in support of Lexmark International in its Supreme Court case against Impression Products. in Impression Products v. Lexmark International. The professors argue that although patent exhaustion provides the baseline rule for sales of a patented product by a patent owner, parties should be free to contract around the baseline rule in their business dealings. The brief’s principal authors are Professors Ted Sichelman and Jonathan Barnett. 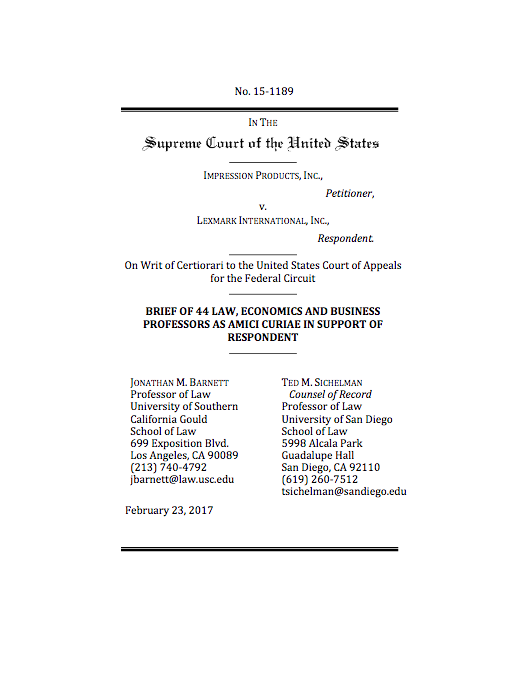 The full brief and list of amici is available here: http://sls.gmu.edu/cpip/wp-content/uploads/sites/31/2017/02/Impression-v-Lexmark-Brief-of-44-Professors-as-Amici-Curiae.pdf.